Bill was asked to form as many triangles on top of a flat table using his 5 pennies (3 coins on the table where centers are connected by imaginary lines to make a triangle). His teacher told him that for every triangle formed, Bill will be paid a nickle (5 cents) if he declares it. But, for every triangle that does not intersect with other triangle he declared, he will be given a dime (10 cents). How should Bill place all his coins on the table for greatest earning? First, make a roughly equilateral triangle by placing pennies A, B, and C flat on the table. This forms one triangle. Next, balance penny D on its edge in the center of triangle ABC. 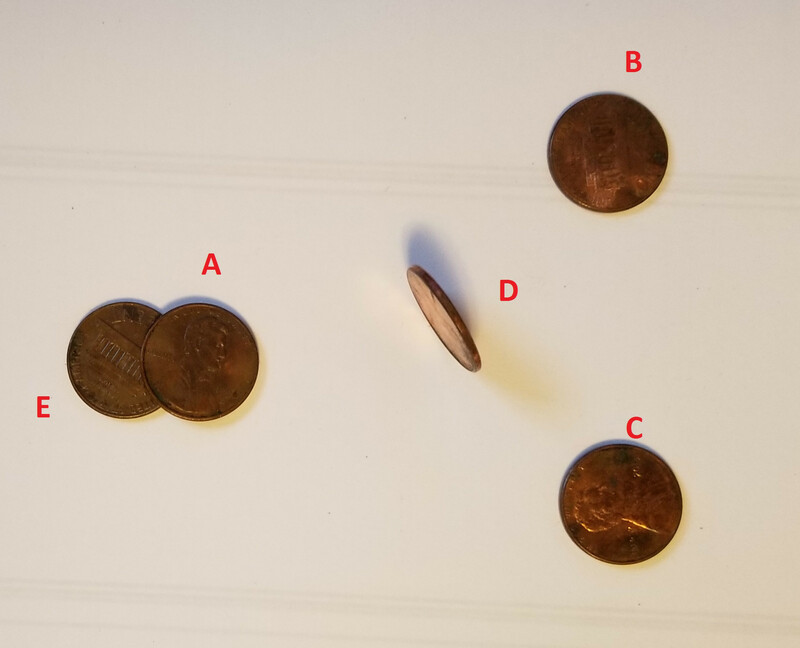 This forms three more non-intersecting triangles in the air, as the center of D is elevated relative to the centers of A, B, and C. Lastly, place penny E flat on the table, in line with pennies A and D. This forms three non-intersecting triangles in the air, each involving E and D. At this point, the four pennies flat on the table form four triangles that overlap. We can recover BCE and keep the three triangles ABC, ABE, and ACE if we can slightly lift the center of A without going over the line between the centers of A and E. To do so, simply pick up A and rest it partly on E, raising its center. it's impossible to put more than three coins on the table without forming intersecting/partially overlapping triangles. Bill should just concentrate on making as much triangles, so if he puts the five coins randomly on the table and makes sure there aren't three collinear ones, every three coins will form a triangle, so he'll get 5 over 3 = 10 triangles and earns 50 cent. with a bit of lateral-thinking, he can put one coin on the table, add three coins in a layer on top of the first coin, and finish with the last coin. Looking at the configuration in three dimensions, none of the 10 triangles are intersecting and he'll get 10 * 10 = 100 cents = a Dollar Bill. 10 triangles, or $1.00 profit declaring no triangles. Any 3 coins on the table that are not co-linear will form a triangle. To maximize his returns, Bill has to put all 5 coins on the table such that no 3 form a straight line which is quite simple. Bill should not declare any triangles. The problem does not state he won't get paid 10 cents for a triangle he doesn't declare, just that he won't get paid 10 cents if it intersects one he did declare. By declaring no triangles, Bill guarantees each triangle will earn him 10 cents. Not the answer you're looking for? Browse other questions tagged lateral-thinking geometry coins or ask your own question. Arrange ten coins in a bowling formation. Fewest pennies to remove so no three pennies that remain have centers that form an equilateral triangle?